Remember how colorful and comfortable your furniture looked when it first arrived in your home? It doesn’t take too long for furniture to wear down and get a little dirty, especially in homes with children and pets. That’s why hiring a Fort Wayne furniture cleaning service is a good idea. Furniture cleaners can restore color, comfort and quality with their professional equipment and safe solutions. Professional furniture cleaners provide a thorough service that includes vacuuming all of the upholstery and cushions to remove surface-level dirt, allergens, pet hair and more. The equipment is a combination of a handheld tools, suction hoses and disposal tanks to remove all of the dirt. The furniture cleaning company then applies their cleaning solution to the upholstery and the couch or chair. Be careful hiring a Fort Wayne upholstery cleaning service that uses soap, detergents or chemicals to clean furniture. You want to schedule furniture cleaning with a company that only uses all-natural products during their service. After the solution settles onto the upholstery the technician will then use their equipment to extract all of the solution and dirt they are able to. If the company uses soap then this process will require a lot of water because it takes a lot of water to rinse soap out of fabric and upholstery. The more water the furniture cleaning company uses the longer the furniture will take to dry. Chem-Dry of Fort Wayne furniture cleaning service doesn’t use any soap or chemicals at all to clean upholstery. We use carbonation in the form of The Natural®. The Natural doesn’t contain soap so when it is time to rinse it out of the furniture we don’t need much water at all. In fact, to rinse our solution from upholstery requires 80% less water than companies that steam clean furniture or use soap. 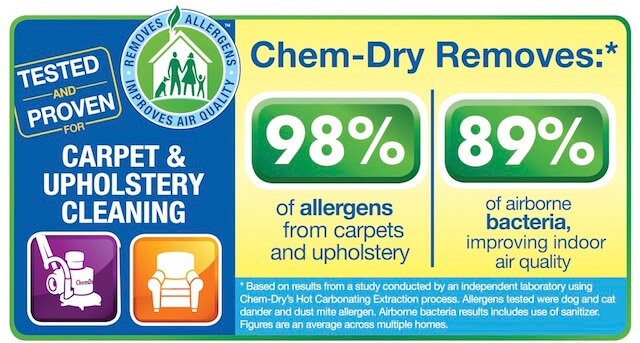 This means your furniture will dry very fast if you hire Chem-Dry of Fort Wayne. Not only does furniture dry fast after our service, but it is healthier too! 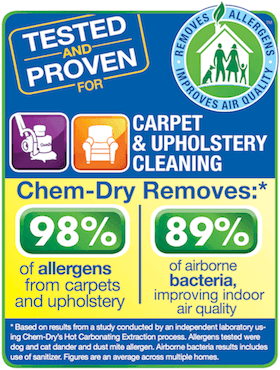 Chem-Dry of Fort Wayne upholstery cleaning eliminates over 98% of allergens from upholstery. 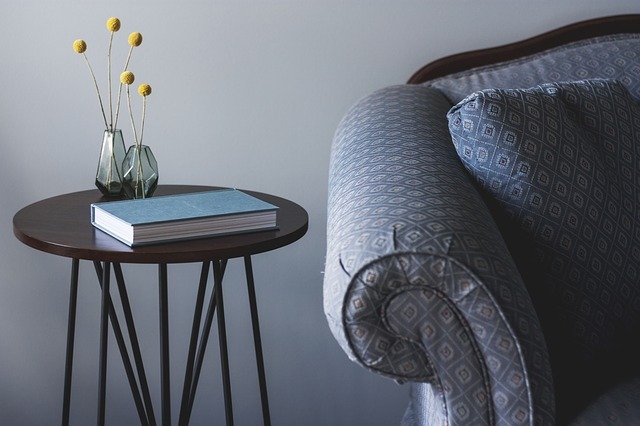 If your couch or chairs look dirtier than you want or if there are stains and pet hair on them, call Chem-Dry of Fort Wayne at (260) 409-1138 to schedule furniture and couch cleaning today!